Today in currency trading the EUR/AUD moved up very strong on the trading signal you see below. The EUR (EUR) was strong on all pairs and the AUD (Australian Dollar) was also weak. This pair is trending higher on the D1 time frame. Since the overall trend on the EUR/AUD is down on the largest time frames we would scale out some lots and take some profit, however this pair could continue higher for another day or two. The trading signals you see below are from The Forex Heatmap®, our live signal system for 28 currency pairs. 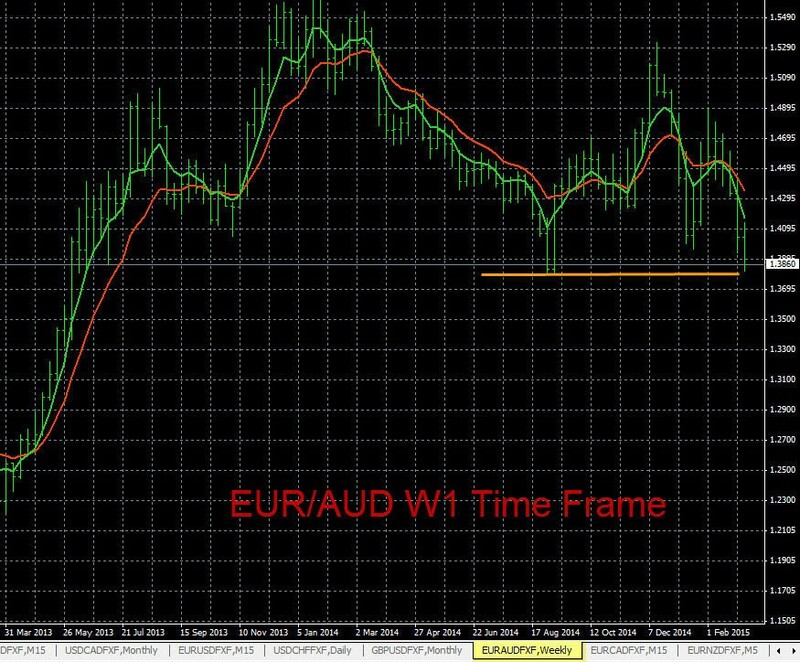 This is a chart analysis of the EUR/AUD trend on the W1 time frame. The trend is currently down. The current support level is around 1.3845, traders can set a sell alert here, when the alert hits look for a sell signal on The Forex Heatmap®. There is also one level nearby at 1.3800, but below there it has substantial pip potential, possibly down to 1.2500. The simple trend charts you see below are exponential moving averages, set on 5 and 12 time periods, they can be set up on any forex chart system. 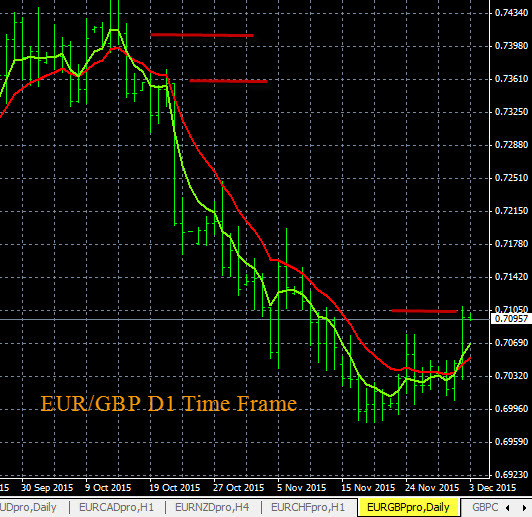 The EUR/CHF is trending higher on the D1 time frame as shown on the chart below. Above the current resistance of 1.0750 we see no nearby resistance, and excellent upside potential. Nearly all of the CHF (Swiss Franc)pairs indicate CHF weakness and are now trending on this basis. These forex trend charts are exponential moving averages provided free to all of our clients. You can go to our home page and check the link to the trend indicators to follow the trends on 28 pairs. 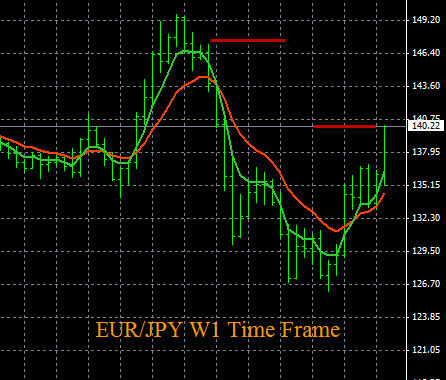 We use multiple time frame analysis for all of our forex market assessments, segregated by individual currency. 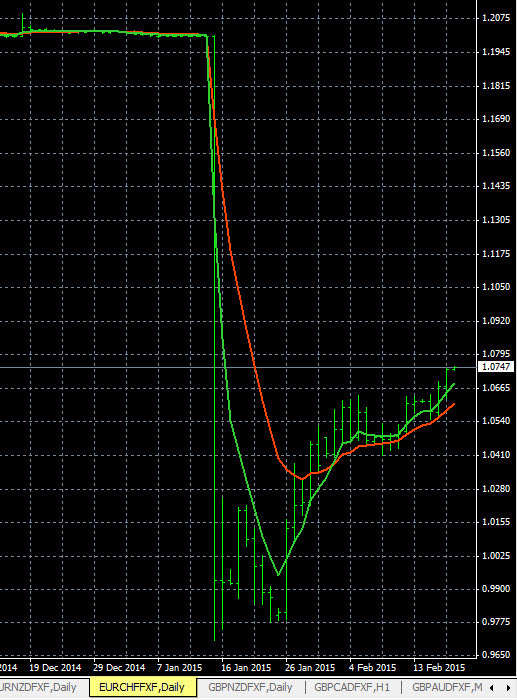 Today in forex trading the EUR strength cased movement on many pairs. The Euro (EUR) was strong on all pairs, there was also some AUD (Australian Dollar) and CHF (Swiss Franc) weakness on the market. The EUR/AUD moved up strong and is forming a D1 time frame trend. It still has more upside and we will be preparing more trading plans to buy this pair. The EUR/CHF also moved up strong and this pair will likely continue higher as it has no nearby resistance. The live trade signals you see below for these EUR pairs are from The Forex Heatmap®.